Product prices and availability are accurate as of 2019-04-20 05:33:34 EDT and are subject to change. Any price and availability information displayed on http://www.amazon.com/ at the time of purchase will apply to the purchase of this product. 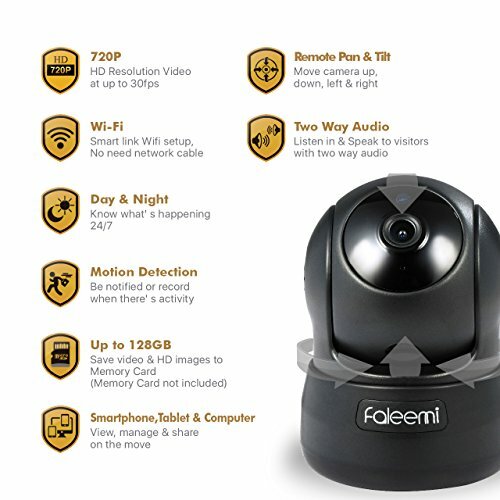 The Faleemi HD 720P Pan & Tilt IP Camera is a simple to use camera that can be conveniently positioned within the home (within wireless range of your internet router) and remotely controlled from your computer, tablet or Smartphone. It is as easy as 1,2,3 by QRcode setup via Faleemi App. It features crystal clear picture quality, capturing video in full HD 720P at 30 frame per second, inclues a built-in microphone and speaker to allow you to listen and speak back to where the camera is located, a SD socket to capture video onto a SD card (up to 128GB, not included) and a wealth of other great features. If you want a simple surveillance product to protect your home or a discreet way to monitor (and listen/speak to) children, elderly relatives or pets wherever you are in the world, then this is the ideal solution for you. Superb HD 720P (Resolution of 1280x720) Video at 30fps. 24/7 Record and Playback via local Micro SD Card (Max. 128GB), FTP Pictures Upload. 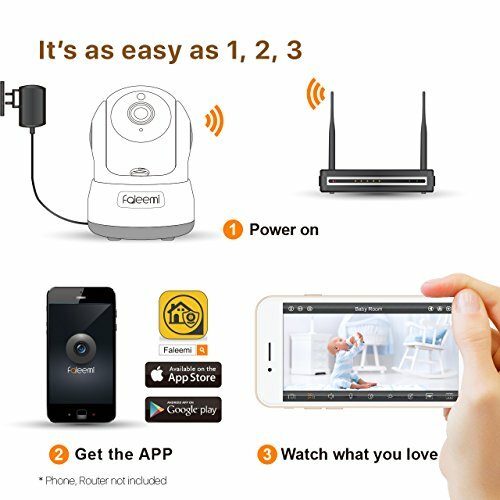 3 Step QR code Setup via iPhone or Android Smartphone using Faleemi App (Free to download), Special Smartlink Technology for Quick WiFi Setup. Immediately Stream Video and Bidirectional Audio to Your Smartphone, Tablet, Apple Mac or Windows PC. 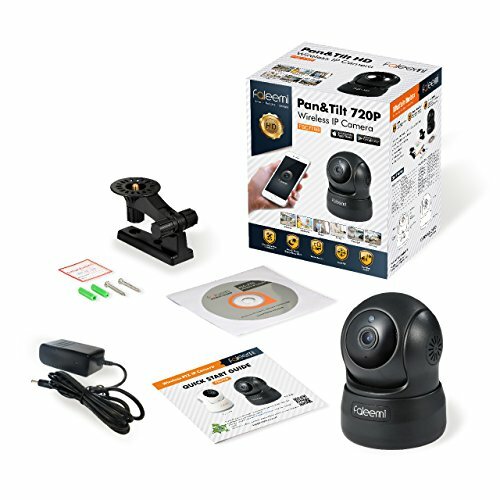 Video Setup Guide: https://youtu.be/jaDVuVwjaS8 Super Wide Viewing Angle, Remote Pan/Tilt (Horizontal 270 degree and Vertical 60 degree), and IR LED for 24 Hours Monitoring, Night Vision Up to 16 feet. Keep an Eye on what you love. 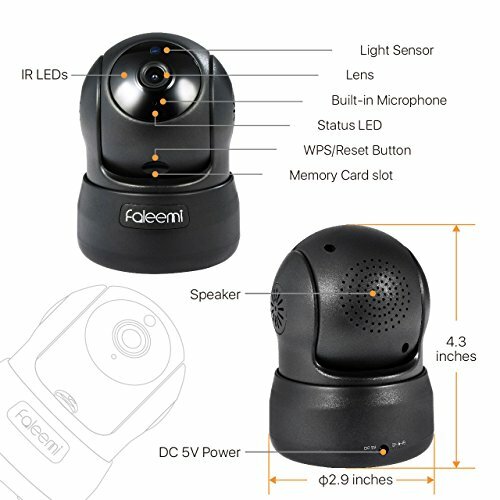 Communicate with Two Way Talk, Intelligent Motion Alerts, Email Alerts Snapshots as well as Mobile, Windows PC, Mac OS and Web (Safari, Firefox, IE and Chrome Supported). 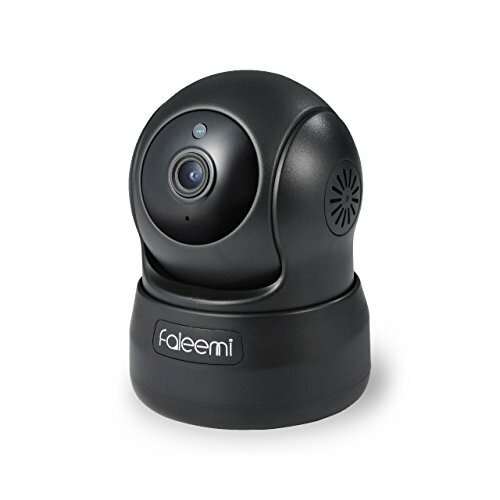 Please note: this is a 802.11b/g/n 2.4Ghz Wi-Fi band camera, If you use dual-band router, please connect the camera to the 2.4GHz WiFi.Superb Build Quality Backed by a Full 1-year Warranty and Lifetime Support Provided Directly from Faleemi. Our Support Team is available by email and phone. If you need phone call support, send your phone number to support@faleemi.com. Or call +1 213 293 3560 on 6:00am ~ 12:00pm (EST) / 6:00pm ~3:00am (PST).